Philip Hyde's photographs helped expanded or established many national parks and wilderness areas of the Western U.S. He first photographed for the Sierra Club in 1950 as official photographer on the summer Sierra Club High Trip with David Brower. Many people refer to Philip Hyde as the underappreciated master landscape photographer of the 20th century. His photographs participated in more environmental campaigns than those of any other photographer. At the birth of the modern environmental movement, he was one of the primary illustrators of the groundbreaking Sierra Club Exhibit Format Series. He dedicated his life to defending western American wilderness, working with the Wilderness Society, National Audubon, and others. His color photographs changed landscape photography as they helped to establish color photography as a fine art. His photographs helped protect Dinosaur National Monument, the Grand Canyon, the Coast Redwoods, Point Reyes, King's Canyon, Canyon de Chelly, the North Cascades, Canyonlands, the Wind Rivers, Big Sur and many other National Parks and wilderness areas. 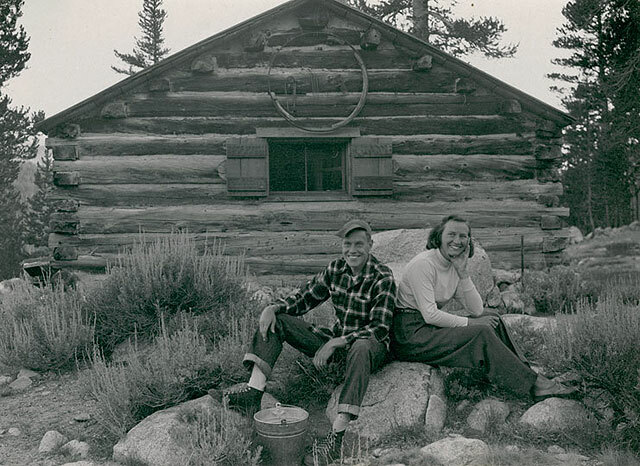 Ardis and Philip Hyde at the McCauley Cabin behind the Sierra Club Parson's Lodge, Tuolumne Meadows, Yosemite National Park, 1949 by John Rogers, a classmate of Philip Hyde's at the California School of Fine Arts. Ansel Adams helped the Hydes become caretakers of the Parson's Lodge for the summer of 1949, while Philip Hyde was in photography school. That summer Philip Hyde made a number of photographs that participated in major museum exhibitions with the work of Ansel Adams, Edward Weston, Brett Weston, Imogen Cunningham and other definers of the medium and the West Coast tradition. Ansel Adams, Eliot Porter and Philip Hyde were the three primary photographers of the Sierra Club Exhibit Format Series. The Series influenced a generation of photographers as it redefined the photography book and brought international attention to the protection of wild places through photographs. While Ansel Adams and Eliot Porter were both Sierra Club Board Members and committed conservationists, Philip Hyde dedicated his life to the portrayal and protection of wilderness chiefly through photography. Both Ansel Adams and Eliot Porter considered the art of photography their foremost reason for making photographs. Ansel Adams went so far as to say that he did not want people to view his photographs as propaganda for any cause. If his images were used in environmental campaigns that was all for the good, but he did not want that to be thought of as the motive for their creation. In contrast, Philip Hyde expressly stated that his reason for being a photographer was to "share the beauty of nature and encourage the preservation of wild places." Though he had fine art training in Ansel Adam's photography department at the California School of Fine Arts, now the San Francisco Art institute, a fair portion of Philip Hyde's photography was documentary. He became the "go-to-guy" for Executive Director David Brower. Eliot Porter was a doctor. Ansel Adams was awarded two Guggenheims to photograph the national parks. Meanwhile, Philip Hyde, young, motivated, talented, willing to work for little besides expenses, could take off on short notice wherever David Brower and other conservation leaders sent him to bring back images that would show them the beauty each place had to offer. Between the Exhibit Format Series and other photography books of the same era published by the Sierra Club, Philip Hyde had more photographs in more of the volumes than any other photographer. The Exhibit Format Series was conceived in 1960 by Ansel Adams, Nancy Newhall and David Brower. The first book in the Series, This Is The American Earth, mainly consisted of Ansel Adam's photographs and Nancy Newhall's eloquent prose. The creators also invited a few other photographers to participate such as Edward Weston, Minor White, Philip Hyde, Cedric Wright, William Garnett, Wynn Bullock, Henri Cartier-Bresson, Eliot Porter, Pirkle Jones and others. An exhibition of the photographs toured nationally and internationally. In 1962, the Sierra Club published Eliot Porter's In Wildness Is the Preservation of the World. It outsold all of the other books in the Exhibit Format Series, including This Is The American Earth. Eliot Porter became known as the man who introduced color to landscape photography. However, the same year the Sierra Club also published Island In Time: the Point Reyes Peninsula with text by Harold Gilliam and photographs by Philip Hyde. Island In Time was not as planned an art project as In Wildness, but it also helped set the new trend as it exhibited beautiful color photographs as well as black and white images. While Philip Hyde became the first landscape photographer to master both mediums, Island In Time helped raise the funds to purchase the land that became Point Reyes National Seashore. 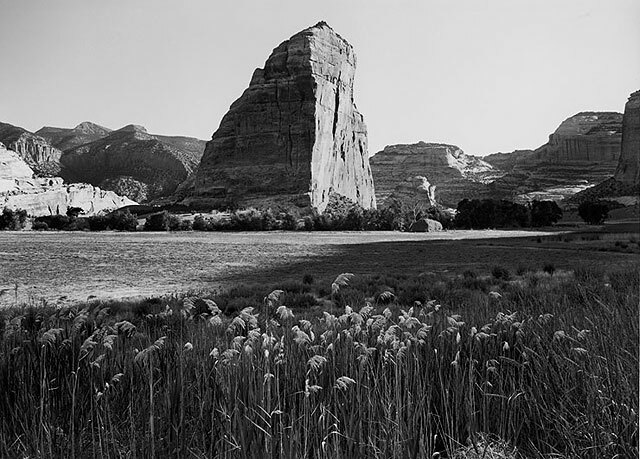 American Photo Magazine named Philip Hyde's photograph, "Cathedral In The Desert, Glen Canyon, Utah, 1964" one of the top 100 photographs of the 20th century. Ansel Adams said that Philip Hyde was "one of the very best photographers of the natural scene in America." Pulitzer Prize-winning photographer Jack Dykinga said "Philip Hyde inspired many of the 'Who's Who' of Landscape Photography working today." In Outdoor Photographer and many other magazines, Philip Hyde is referred to as "one of the all-time most influential landscape masters." Born and raised in San Francisco, Philip Hyde lived for 50 years in the house he built in the Sierra Nevada Mountains of California with his late wife Ardis. At the California School of Fine Art, now the San Francisco Art Institute, Philip Hyde studied under Ansel Adams, Minor White, Edward Weston, Imogen Cunningham, Lisette Model, Dorothea Lange, and other definers of the medium. Philip Hyde's work has appeared in more than 80 books and 100 major publications including The New York Times, Audubon, Life, National Geographic, Aperture, B&W Magazine, Fortune, and Newsweek. His work has been exhibited in more than one hundred of North America's finest venues. Please see lists of exhibitions under "INFO". The North American Nature Photography Association honored him with a lifetime achievement award in 1996. He received the California Conservation Council's Merit Award in 1962 and the Albert Bender Grant in 1956. After losing his eyesight in 2000, he relied on dreams for glimpses of the natural world he spent a lifetime defending. His son, David, who walked many wilderness miles with his parents, continues to involve the historically significant photographs in conservation efforts. More about Philip Hyde at philiphyde.com. Steamboat Rock, Colorado. Photo by Philip Hyde, used with permission. My intent is not to awe, but to stimulate empathy and love. My basic concern is with what Emerson called 'the integrity of natural objects.' I am not interested in pretty pictures for postcards. I feel better if I just get a few people to see som#240ing they haven't seen before. I rarely wait for light or for some missing element, partly because I wish to avoid pouring nature into a mold, but also because waiting for som#240ing to happen may well mean missing som#240ing else. Black-and-white is excellent experience for color work because it encourages sensitivity to form, texture, tonal gradations and the quality of light. Color photographs that lack these qualities and rely too much on the shock value of color alone will not sustain interest. I begin to see when I leave the car behind. People are ever hurrying over the increasing highways that penetrate lovely country and either lacerate it or pass it by unseen. A mind at peace may be found in any individual or people who have kept touch with what the land is saying and who lack the benefits of instant dissemination of the human troubles that make news. After reading Gandhi, I see that what we need now is a peaceful environmental revolution. The Earth will survive, but will man survive on the Earth? 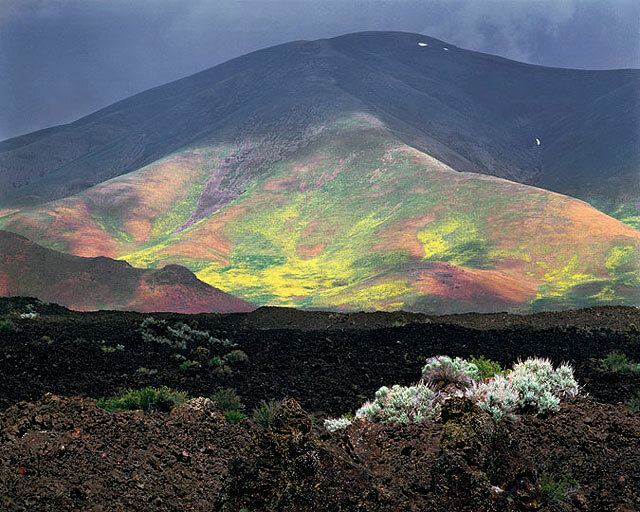 Craters of the Moon National Monument and Preserve, Idaho. Photo by Philip Hyde, used with permission. The most important in The Sierra Club Exhibit Format Series containing the most photographs are marked with a star (*). **"Drylands" and **"The Range of Light" were his crowning personal achievements and contain far more photographs than any of the other books including those in the Sierra Club Series.